In his book “Before the Dawn” published in 1957 Brigadier Smyth VC, MC wrote of disembarking at Cherbourg in April 1940: “…a French sentry leaned up against a sentry box with his rifle negligently propped up beside him. He was fat, unshaven, and incredibly dirty; he had his hands in his pockets and was smoking a cigarette. I often thought of that sentry in the days to come. 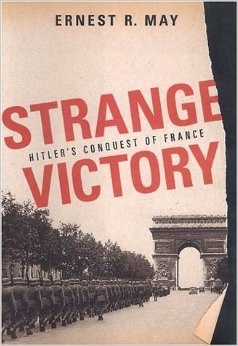 He somehow symbolised the decline of France between the wars and the way in which the fine French Army of 1918 had deteriorated by 1939…” This myth, born in the defeat of 1940, perpetuated in the memoirs of that campaign generation and revitalised by the surge of interest in German Wehrmacht performance by the US and UK militaries in the 1980s does not stand detailed scrutiny; this book provides some such much needed scrutiny of it. This is a book more about politics and systems than it is about tactics and strategy. It focuses on analysis of why the campaign of 1940 unfolded as it did, rather than on the campaign itself. May’s thesis is that a combination of poor policy decisions, hubris, and systemic failures in intelligence (Allied) combined with: excellent political intelligence, operational art and pure luck (German); and that these all played a part in the the rise of the Wehrmacht and the collapse of the Third Republic. Hitler’s use of Political Intelligence. Hitler’s use of open source intelligence (OSINT), the Forschungsamt (a Signals Intelligence agency much like GCHQ and the NSA) are not widely known, but played a critical part in his decision making. In the 1930s access to such intelligence gave Hitler confidence in what international reaction would be to his various moves, confidence that the military hierarchy lacked. There is much to learn today from Hitlers use of such intelligence, and for those operating at the operational levels and above it stresses the importance of the Information sphere of operations. In December 1939 a strategic level war game was held at Zossen to in effect, test the original Plan Yellow concept against Manstein’s alternative. Colonel Liss was to play the part of Allied commander-in-chief Gamelin. Liss “did not have to act according to German principles, but was supposed to adopt decisions and measures which . . . the Allied command would presumably follow.” The Zossen wargame is a master class in wargaming and should be known and studied by all those who work in Intelligence and Plans. My biggest frustration as a Planner was in getting intelligence staff to think and respond like the enemy and to give me confidence that the enemy responses (and their timelines) were credible. The German offensive through the Ardennes should not have come as the surprise that it did. The reason that it did is because of the systemic flaws in Allied intelligence and the culture of Allied (especially French) Intelligence which favoured technical intelligence over the integration of intelligence with operations. There are key lessons here for intelligence staff, operations staff and politicians. Lessons which were re-visited in the build up to the invasion of Iraq in 2003. Brigadier Smyth believed in the myth of France’s collapse, and he was there. History is a matter of both analysis and perception, and in analysing perceptions it is important to put people’s experiences into context. The French were not averse to war with Germany, the contrasts in reaction to the announcement of war between Paris and Berlin are stark. The French also fought well, the crossing of the Meuse was hard fought, and the battle of Hannut on May 13 and 14 deserves to be better known. For Brigadier Smyth context that would have helped would have been that Cherbourg was garrisoned by third rate reservist formations. For professionals studying military history a basic understanding of how to study history is a must. This book should be read by those concerned with the design and use of intelligence systems, as well as those involved in operational level planning. For those students of the 1940 campaign this is a much needed analysis which adds context to a much misunderstood campaign. It should be read in conjunction with Karl-Heinz Frieser’s Blitzkrieg Legend.